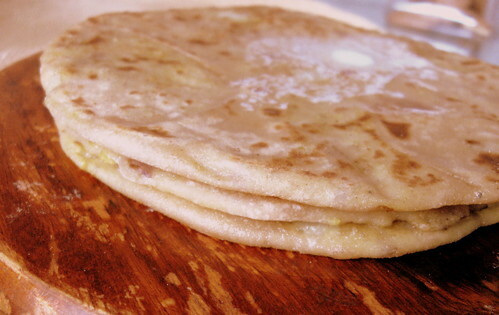 Aloo Paratha for World Bread Day 2009! It couldn't be said better. Bread is perhaps the longest running love affair through the ages for chefs and gourmands alike. Nothing inspires more than the smell of bread baking. And, the feel of biting into a piece of generously buttered, freshly baked bread.. Oh! no pleasure greater for the taste buds! I was initially thinking of making a basic white bread that is elegant in its simplicity and drives home my point above. But, in the spirit of the upcoming Indian festival of Diwali, I decided to go back to my roots and highlight one of the favorite breads of my country - Aloo Paratha, unleavened bread stuffed with cooked potatoes and spices! That's the other good thing about bread. It is so versatile. Across the world, every culture has had some form of it, leavened or unleavened as the staple in their diet. In India, especially in the North and the middle, wheat is a staple grain made into various unleavened breads; rotis, paratha (plain and stuffed), naans and all the stuff that you get in a bread basket at an Indian restaurant. So, here it is.. The aloo paratha in its simple magnificence. I am sending this as my entry for World Bread Day 2009 event, hosted by Zorra of Kochtopf. The idea was to bake a, bread with or without yeast, use sourdough, experiment with different flours, add some seeds. P.S: I am thrilled, I got through this post in! Yay! Mash the potatoes and incorporate all the filling ingredients. Set aside until cooking time to let flavors blend. You can refrigerate the mixture. In a medium bowl sift together the flour and salt. Add the ghee to get a meal like mixture. Add 3/4 cup of water and mix. If the mixture is too dry, add more water one tablespoon at a time to get an elastic, tacky dough that is not sticky. Knead for a couple of minutes. Tip: If at any point, you can't get past sticky, oil your hands lightly and continue kneading. The dough will come together in short order. Cover dough with a damp kitchen towel and set aside for atleast 20 minutes. Peel off about a tablespoon and half of dough and roll out on a lightly oiled and floured surface into a round about 1/8 inch thickness. You may have to flour the dough lightly as you roll to prevent sticking and tearing. Place a generous amount of the potato filling in the center of the round and fold the sides over the center. Place the stuffed dough fold-side up, dust both sides with a bit of flour and roll out carefully into a 6 inch round. Tip: With every roll out, keep turning the dough clockwise by 15 degrees to make sure that it doesn't stick. If at any point, the dough sticks or the filling starts coming out, pat with flour and continue carefully. It is ok to have some filling peeking out in spots, don't worry about it. Heat a non-stick flat griddle and spread about half teaspoon of butter. 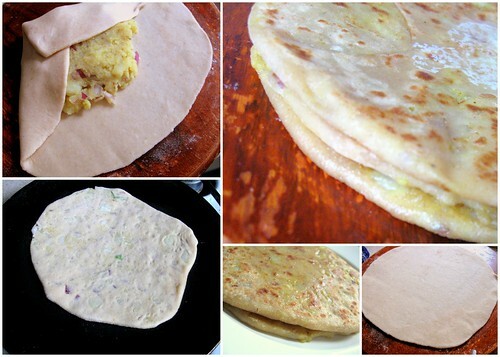 Grill each side of the paratha until cooked (little brown spots will appear across the surface). Remove onto plate and top with a pat of butter.